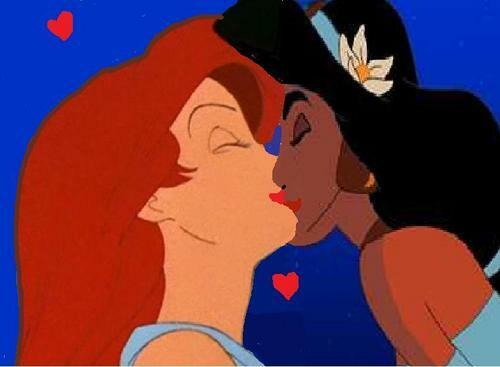 Ariel+Jasmine! <3. . HD Wallpaper and background images in the disney crossover club tagged: ariel jasmine crossover disney kiss. This disney crossover fan art might contain anime, grappig boek, manga, cartoon, and stripboek. That's a little lezbo. Sorry, but it's hard to imagine DISNEY PRINCESSES like this. ^Eh, it's ok. This was just a request from a friend anyways. This is my favorite Disney yuri couple!